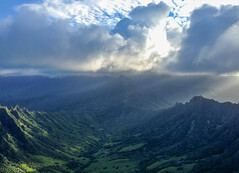 We enjoy a variety of clouds on Oahu. For our classic cross country flying days, we like high cloudbase and shapes that aren't too tall. Yesterday at Kahana we had the less favorable cloud condition: very low base and towering shapes. But we still managed some sweet cross country flying, with round trips to Kualoa and Punaluu, and the cloudscapes were breathtaking as the afternoon sun filtered through. I don't think it gets more beautiful than that. I flew to Kualoa and back once by myself, while poor Thom banged his head against the bay crossing over and over, battling heroically to climb out of the grovel pit, but in vain. I think his new talisman is cursed with a voodoo hex, so he's retiring it. We can't call him Gimli anymore - it's not good for his bay crossing karma! Dwarves don't soar over the mountains - they burrow through them! I crossed again later followed by JK and Mad Dog, who took the widest tack I've ever seen, a real sailor's line, and it paid off beautifully. We surfed the wispies at Kualoa for quite a while, and then we flew to Punaluu for a quick view of Sacred Falls before doubling back to Kahana. It was possibly the most gorgeous afternoon conditions I've seen. I shot some great video footage which I'll post up when it's ready. In the meantime I also took a few photos - hopefully they will show just a hint of how beautiful it was. Roll call: Drew, Woody, Bryce, me, Thom, JK, Mad Dog, Harvey, Bonnie. They were very forgiving and understood completely, especially after i shared some of my photos with them. Yup the Dwarf is out!!! I groveled on Crouching Lion what seemed like forever at first just trying to get up. Then it was just trying to get enough to make it back. I hate the grovel pit. If I don't have 1200 crossing the knob from now on I am turning back. Wasted too much time then to watch JK and Mad Dog buzz over my head was the salt in the wounds. Here's to higher leaves and better lies and no more voodoo passengers. It was a great day and especially for Bonnie's Aloha flight (for awhile). See you soon. Our sites are trending to more Thermic these days. Times are changing to the interesting. I was still rootin' for you, Sidehill... you came back lower than I've ever seen (I think).